We’d love your help. Let us know what’s wrong with this preview of Discovery by Leslie Schweitzer Miller. The life of a nineteenth century priest has a profound effect on the future of a couple in 2012. Together, these intertwined stories will take you on the journey of DISCOVERY. Abbé François Bérenger Saunière arrives in Rennes-le-Château in 1885 as impoverished as the remote mountain village itself. Inspired by the true story, this unconventional priest amasses a fortune, cr The life of a nineteenth century priest has a profound effect on the future of a couple in 2012. Together, these intertwined stories will take you on the journey of DISCOVERY. Abbé François Bérenger Saunière arrives in Rennes-le-Château in 1885 as impoverished as the remote mountain village itself. Inspired by the true story, this unconventional priest amasses a fortune, creates a magnificent estate and brings his ancient, crumbling Church of Saint Maria Magdalena to glory. During the renovation he unearths a first century urn containing two shocking documents--a parchment with grave consequences for his friend, Father Antoine Gélis, and a papyrus he feels morally bound to hide for safekeeping. Dr. Giselle Gélis is resigned to living within the insular world of biblical scholarship until Dr. David Rettig, a gregarious American archeologist, bursts into her life in 2012. He's more familiar with Shakespeare and poetry than the Gospels; she's a pragmatist, he's a dreamer--but it's kismet, nonetheless. A trip across the south of France to learn more about her great-great-uncle's life is transformed into a romantic sojourn, with nights spent in old castles and days devoted to atmospheric holy sites linked with Giselle's heroine, Marie-Madeleine. The pièce de résistance of this idyllic week would have been exploring Rennes-le-Château and puzzling over the unsolved clues; instead, they stumble on the discovery of a lifetime. To ask other readers questions about Discovery, please sign up. For years there has been reason to believe that there is more than the bible tells us. Important parts of history might be left out. What was the role of Mary Magdalen among the disciples, and what was her connection with Jesus? Following the Cathars and Templars into France, we arrive at the Languedoc region, where various sites are dedicated to Marie Madeleine. We get a glimpse of history. Moving on to the late 19th century and the restoration of the church of Rennes le Chateau. Father Sauniere For years there has been reason to believe that there is more than the bible tells us. Important parts of history might be left out. What was the role of Mary Magdalen among the disciples, and what was her connection with Jesus? Following the Cathars and Templars into France, we arrive at the Languedoc region, where various sites are dedicated to Marie Madeleine. We get a glimpse of history. Moving on to the late 19th century and the restoration of the church of Rennes le Chateau. Father Sauniere is a man of God as well as a free thinker. He inspires many of his flock to be more than just followers. During the restoration he discovers some well hidden treasures that could upset the religious world and he decides to keep them hidden. From here the book alternates between 1890 and 2013, focussing on the impact of new science regarding early christianity. Biblical scholar Giselle teams up with archeologist David, travelling to the south of France to see for themselves if the legend holds any truth. An unexpected find turns their world upside down. Discovery is a spectacular story, full of mystery and adventure, beautifully written at a pleasant pace. Giselle and David are intelligent beings, constantly challenging each other. The touch of romance is adorable. The religious characters throughout the centuries are well portrayed and believable. The vivid descriptions of the churches and the natural beauty of the Languedoc region are breathtaking. First I feel I need to acknowledge the cover of this book. The artwork so nicely conveys the beauty and depth of the story. The author, Leslie Schweitzer Miller, is also an excellent artist. The story Discovery centers around religious scholar Dr. Giselle Gélis and archeologist Dr. David Rettig, who while falling in love travel the Languedoc region of France. Their journey to Rennes-Le-Château in search of secrets regarding Giselle's ancestor Father Antoine Gélis, introduces the theory of Mary Magdalene's time in this region. They explore many fabulous religious sites along their travels, including the Basilica, Saint-Maximin-la-Saints-Baume and the Grotto Saints Marie-Madeleine. Intrigue, personal introspective, and controversial discussions of religious ideas are all beautifully woven throughout the story. Historical tales regarding Rennes-Le-Château and Father François Bérenger Saunière are fascinating as well. I found Discovery to be a gently paced relaxing travel through the south of France, enjoyable as a love story while presenting a nice religious discussion. Dr Giselle Gelis and Dr David Rettig meet at a conference, she is a biblical professor and he is an archeologist. Her faith is of the outmost importance to her. He is an atheist. On the surface, you’d think they would never work. But they are both quirky, kind hearted intellectuals. You soon believe that they actually shouldn’t be without each other. But in the background a mystery is unfolding. There are alternating chapters in the book telling the story of a priest many years ago who Fascinating. There are alternating chapters in the book telling the story of a priest many years ago who discovered secret documents hidden inside the walls of the church. The documents become a part of the present day story as well. The documents potentially prove a marriage between Mary Magdalene and Jesus. The implications could be life shattering for many involved and at the very least they would be life altering. Giselle’s faith is at the heart of her. She could possibly accept the idea that Jesus had married but the further questions that arise are ones she will not accept. This puts a serious strain on her relationship with David. I like how parts of the story were grounded in truth but the author was able to take liberties in order to create a story for Giselle and David. I liked the characters and their relationship. It was quite romantic at times and quite difficult for them at other moments. I think you could be a believer or a non believer and appreciate this story. I say that because I think it needs said with a storyline like this. In an attempt to spend ti When Giselle Gélis runs into David Rettig at a biblical studies conference, she’s not expecting a life-changing experience. On the contrary, the thought foremost in her mind is escaping the creepy colleague who seems oblivious to hints of dislike and even outright putdowns. But Giselle and David hit it off, despite their differences of personality and the reality that any relationship between them can only be long-distance: she lives in France while he’s based in Israel. Discovery skips back and forth between Giselle and David’s present and her uncle’s past, with at least one foray even deeper into time as the underlying mystery is gradually revealed. Leslie Schweitzer Miller juggles these multiple realities with aplomb, bringing to life not only the breathtaking scenery of the mountains around Rennes-le-Château, where the central action takes place, but the contrasting time periods and the characters who populate them. This was an interesting twist on the idea that Jesus was married to Mary Magdalene. The author has a great job of weaving the story between different centuries and generations of the lead character's family. I enjoyed the romantic aspect that was intertwined with the plot. Definitely a good book to curl up with on a quiet weekend. I received this book as part of a Goodreads giveaway but the opinions expressed are solely my own. This book was a terrific read. I was already aware of some of the background and theories related to Mary Magdalene in the South of France. When David and Giselle visited the grotto at Saint-Maximin-la-Sainte-Baume, the text reminded me of my visit to this beautiful, remote site. Although, the story was entertaining it was not until the acknowledgements that I realised how much of the premise of the novel was based on known facts. I love a book that not only entertains but also informs. Discovery introduces the reader to a Biblical scholar – Giselle and an archeologist, David. She lives a rather insular life despite speaking several languages and traveling to conferences around the world. He works mainly in Israel excavating the world of the Bible but not following any of the religions it fomented. These two are the main protagonists in the tale but there is another important player – Abbe François Bérenger Saunière. He is the priest assigned to Rennes le Chateau as punishment Discovery introduces the reader to a Biblical scholar – Giselle and an archeologist, David. She lives a rather insular life despite speaking several languages and traveling to conferences around the world. He works mainly in Israel excavating the world of the Bible but not following any of the religions it fomented. These two are the main protagonists in the tale but there is another important player – Abbe François Bérenger Saunière. He is the priest assigned to Rennes le Chateau as punishment but he sees it as freedom. According to the book this area of France has a long history of reverence for Mary Magdalene as there are many who believe she came to the Languedoc after Jesus died and lived the rest of her life in France. There are also those who believe Jesus did not die on the cross but was spirited away and then he went on to live the rest of his life in India. Both of these beliefs go strongly against the teachings of the Catholic church and would be dramatic revelations if ever proven true. That makes them excellent fodder for fictional accounts. Ms. Schweitzer Miller uses bits of the historical record and real people combined with fictional characters to tell her story of well, discovery in the south of France. To share with you what is found would be to share with you the plot and you know I don’t do that. You will have to read the book for yourself. It is an entertaining read – I finished it in an afternoon. I can’t say it breaks any new ground in Biblical mysteries but I found myself quite lost in both the historical half, the romance that blossomed and the overall mystery. It is sort of a cozy thriller as while people are killed there is nothing overtly gory or violent in the book, nor are the protagonists severely threatened. The pressures come from other places. 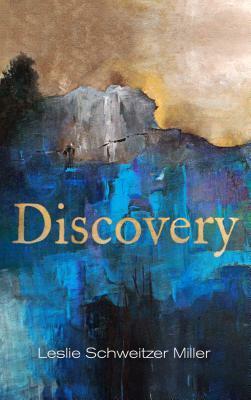 Discovery by Leslie Schweitzer Miller is a free NetGalley ebook that I read in early May. Several vignettes take place between the 1880s and 2010s with an Abbe Jean & Abbe Antoine (a theological researcher) and a couple named David (an archeologist) and Giselle (hyperintuitive) with themes of Mary Magdelene and her marriage to Jesus Christ. David happens upon Jean and Antoine's sacristy, their letters, and ancient pieces of evidence, which creates pulls at his and Giselle's new, yet tenuous r Discovery by Leslie Schweitzer Miller is a free NetGalley ebook that I read in early May. I really enjoyed this book. Giselle and David's romance kept me reading later than I should've stayed up at times, but I wanted to know what was going to happen. I also liked the theology and Biblical references along with the mystery. This was a nice summer read! This is wonderful book that circles around whether jesus and Mary Magdalene were married and what that could mean to today's christian if it were so. This is a wonderful story with multiple storylines. I highly enjoyed it.